IN AVIATION DESIGN, form must follow function. And has there ever been a more aesthetically pleasing airliner than the Lockheed Constellation? Lockheed L-749 Constellation. 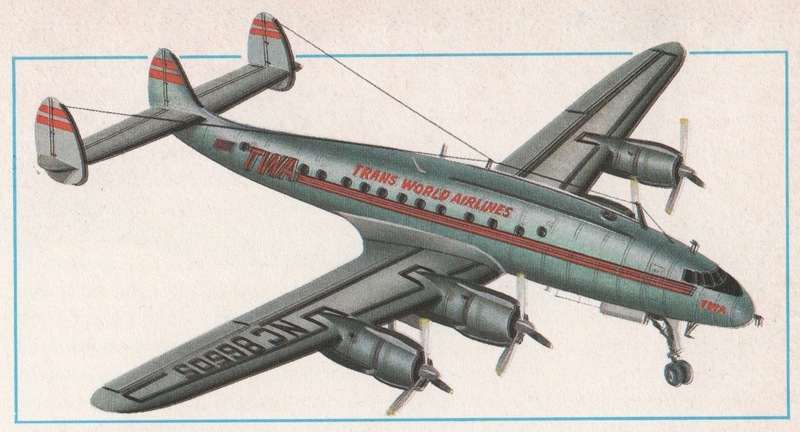 Illustration from World Aircraft Commercial 1935–1960. Here’s a collection of Connie tidbits, gleaned from Airliners from 1919 to the Present Day, by Kenneth Munson, illustrated by John W. Wood et al, Peerage Books, 1972; and World Aircraft Commercial 1935-1960, by Enzo Angelucci, illustrated by Paolo Matricardi, Rand McNally, 1979. I did my usual Internet sleuthing as well. Part 1 today covers Connie’s birth, influenced by Howard Hughes, but also just in time for World War II. Tomorrow in Part 2, she finds peacetime work, even with a U.S. president. Howard Hughes Gets What He Wants. Lockheed had been working on the L-044 Excalibur since 1937, but in 1939 Howard Hughes called for more speed at higher altitude and greater range than the Excalibur’s design specs. Hughes was a major stockholder of Trans World Airlines, and thus he got what he wanted: The L-049 Constellation had a maximum speed of more than 375 mph (faster than a Japanese Zero fighter plane), a cruising speed of 340 mph (100 mph faster than the Excalibur) at 24,000 ft. (1000 ft. beyond Excalibur specs), and could cross the U.S. non-stop. The Constellation project was led by Lockheed’s Kelly Johnson, destined to lead the company’s Skunk Works, and Hall Hibbard. Its design had a sleek dolphin-shaped fuselage with no two bulkheads alike, wing contours similar to those of Lockheed’s famed P-38 Lightning fighter at a larger scale, and a triple tail, this last feature dictated by hangar height limitations. USAF C-69, the military version of the Constellation. This is the seventh production aircraft, #1967. Note its triple tail, P-38 Lightening wing shape, and first-generation round windows. World War II Intervenes. The L-049’s first flight came on January 9, 1943, well into World War II, and subsequent production was initially devoted to military service. 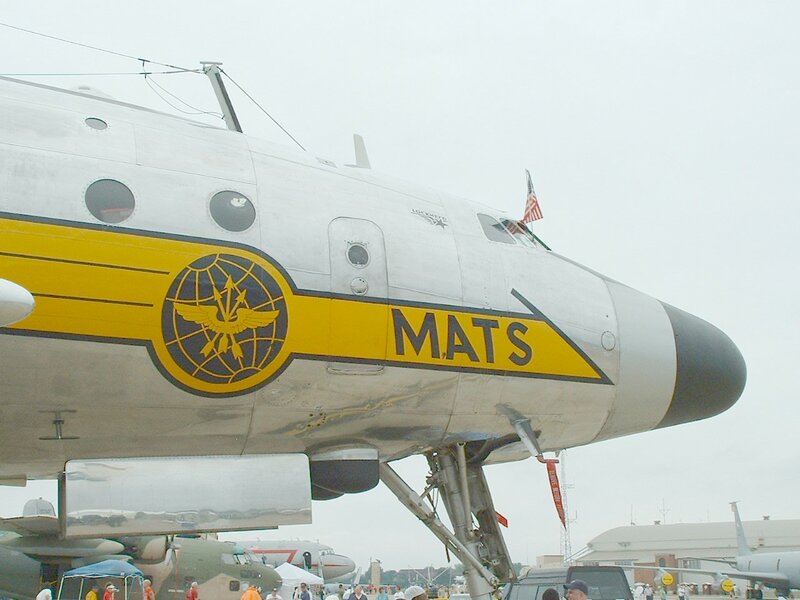 A total of 22 C-69s were produced; not all went into military service, though several continued into the 1960s as part of the U.S. Military Air Transport Service. 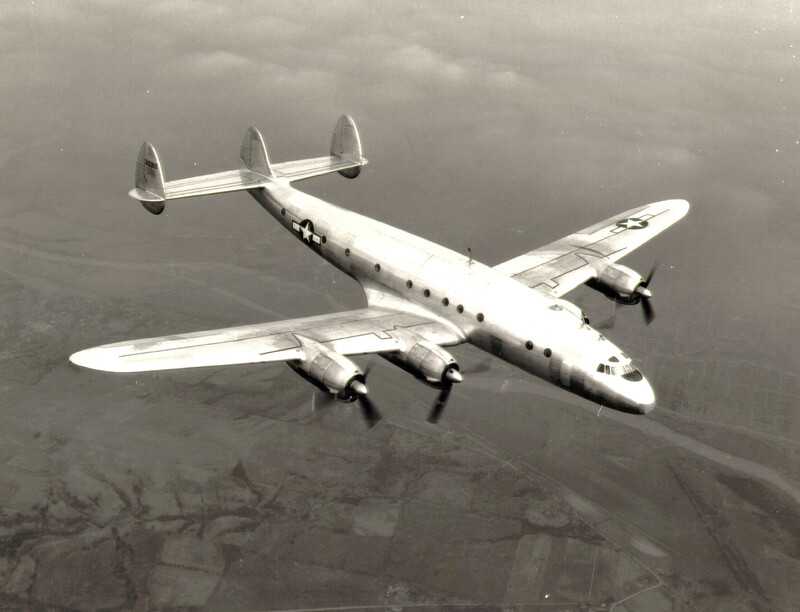 A later variation, this C-121 had duties in the Military Air Transport Service. Image from Aviation Heritage. DH91 Albatross. Had the shape. 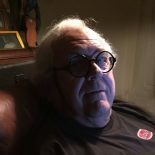 This entry was posted on February 23, 2019 by simanaitissays in Vintage Aero and tagged "Airliners from 1919 to the Present Day" Kenneth Munson John W. Wood, "World's Aircraft Commercial 1935–1960 Enzo Angelucci Paolo Matricardi, Howard Hughes TWA influenced Constellation specs, Kelly Johnson Hall Hibbard Lockheed Skunk Works, Lockheed Constellation L-049, Lockheed Excalibur L-044, U.S. Military Air Transport Service.